BATON ROUGE, La. -- Disturbing new video has surfaced in the police killing of a black man who authorities say had a gun when he was shot on the pavement outside a convenience store. The shooting death of Alton Sterling is being investigated by federal authorities. Sterling, 37, was confronted by police and shot on Tuesday after an anonymous caller said he had threatened someone with a gun outside the store, where he was selling homemade CDs, authorities said. 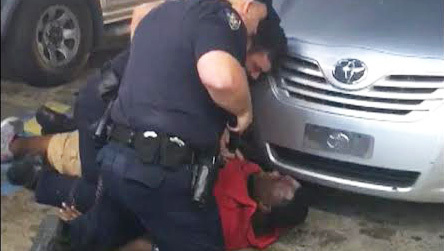 In the video, filmed by store owner Abdullah Muflahi, officers are seen pinning Sterling to the ground. Officers can be heard saying "You [expletive] move, I swear to God," and shouting, "Gun!" before shots ring out. Sterling can be seen bleeding from the chest on the ground. Muflahi told CBS Baton Rouge affiliate WAFB-TV the first officer used a Taser on Sterling and the second officer tackled him. Muflahi said that, as Sterling fought to get the officer off him, the first officer shot him "four to six times." The owner said Sterling didn't have a gun in his hand at the time but he saw officers remove a gun from Sterling's pocket after the shooting. Initial cellphone video of the incident, which sparked outrage and led to local protests, was taken by a community activist and posted online. Baton Rouge Police identified the officers involved as Blane Salamoni and Howie Lake II. They have been placed on administrative leave. At a news conference Wednesday, Baton Rouge Police Chief Carl Dabadie Jr. said that Sterling was armed but that there are still questions about what happened. Louisiana governor John Bel Edwards said he had "serious concerns" about the incident. He called the video "disturbing to say the least." Police audio of the incident has also surfaced. An officer can be heard saying "Shots fired!" in a police dispatch tape obtained by CBS affiliate WAFB. In the police audio, a dispatcher is heard relaying the anonymous caller's report of a gun threat. "Selling CD's on the corner. Gun in his pocket. He pulled a gun on a complainant and told him he couldn't be around there," the dispatcher is heard saying. Officers at the scene can be heard on the audio saying, "Shots fired! Shots fired!" "Both officers OK. Suspect down. I need an EMS code 3 (urgent,)" an officer says. It's not clear which officer is speaking. The shooting stirred anger in Baton Rouge, with hundreds protesting Tuesday night and demonstrations continuing Wednesday. Community leaders and Sterling's family demanded the federal investigation. Baton Rouge police say they have dash-cam video, body-cam video and store surveillance video of the shooting death. Police said Wednesday that the audio and video will be turned over to the U.S. Justice Department. Police Lt. Jonny Dunnam says the body-cam footage may not be as good as investigators hoped for because the cameras became dislodged during the altercation. The head of the ACLU Louisiana says serious questions need to be asked about whether body cameras were working properly.